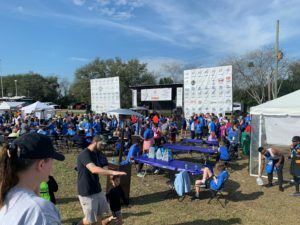 Big Thanks for Bites & Bands! 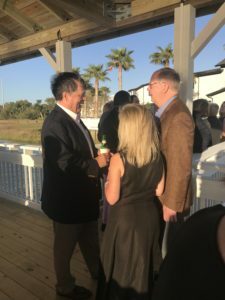 What a great night for Hospice of the Golden Isles (HGI)! 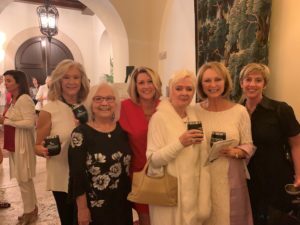 In front of a sold out crowd, patrons enjoyed the sounds of the Randall Bramblett Band, Strawberry Flats with John Keane, and the Pine Box Dwellers while tasting great food from area chefs and drinking lively libations from local and regional distributors. 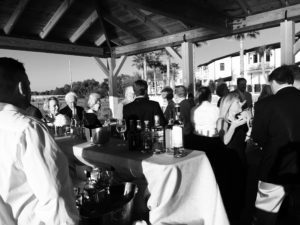 This was the first year that the St. Simons Food and Spirits Festival hosted a one day event in the spring. 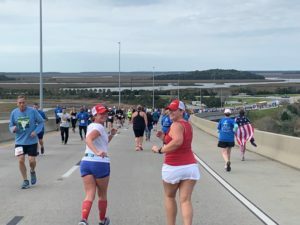 Back to back hurricanes, helped influence the decision to try a new time and feel for the event that’s been going on for the past eight years in various forms. 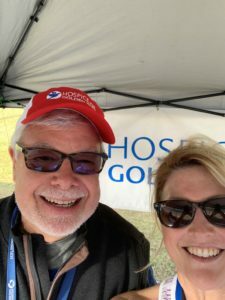 Special thanks to our festival board members and event organizer Beth Williams for the countless hours of planning that went into making this event such a success, and to our HGI volunteers who helped with jobs ranging from emptying trash bags to manning our silent auction. 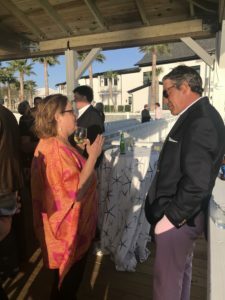 We also so very appreciative of the local chefs and business owners who consistently step up to support our non-profit by donating their time, staff, and talents toward making this event such a great fundraiser for HGI. 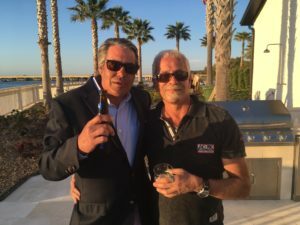 Our 2019 Dove Society Party was an unforgettable night thanks to the generosity and entertaining spirit of our host Frank Salvati. 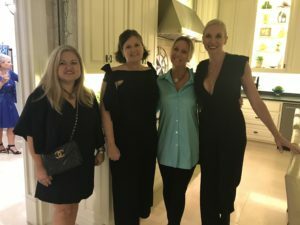 Not only did he open up his home to our Dove Society members again, paying for the event, and making a donation, he also met our match challenge of $5,000 made by an anonymous donor. THANK YOU FRANK! 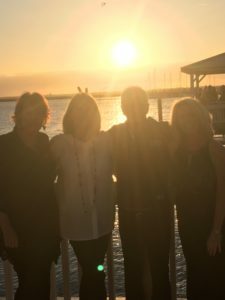 The view from Frank’s new dock was spectacular as the sun was setting over the Frederica River. 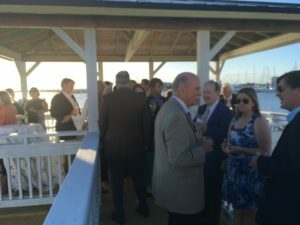 Guests were able to enjoy wonderful drinks and heavy hors’ doeuvres from Halyards Catering, while listening to the sweet sounds of Richard Stratton strumming away on his acoustic guitar. 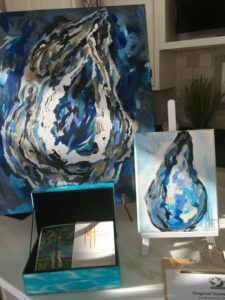 Special thanks for the donations to our silent auction from artist Marden Headley, Davis Love, and Mixed Nuts. On March 7th, 2019, in front of loving family and Hospice of the Golden Isles’ staff, Patrick Coleman married his sweetheart Chyna in the Chapel of Hospice of the Golden Isles. Also present was their 3 week old baby girl Amazin’ Coleman. Chyna says that Patrick is always very attentive to her and that’s what she loves about him. Patrick calls Chyna his “beautiful” and she calls him her “handsome.” Their love story started 2 1/2 years ago, with a friendship that grew into a beautiful relationship. They enjoy spending time together watching movies and cuddling. 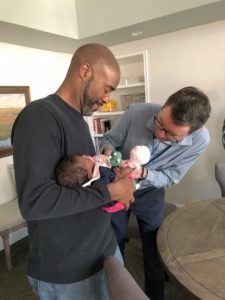 Patrick is also the father of Cassidy Coleman and Bryshere Harris. Before his illness, Patrick worked two jobs and loved to play basketball. 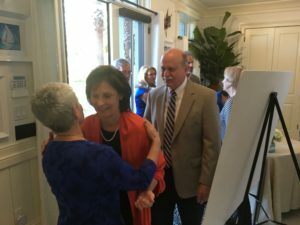 Judge Debra Godwin Duncan of the Glynn County Probate Court performed the ceremony. Also present was Deputy Court Clerk, Elizabeth Reeves. The kitchen staff of Hospice of the Golden Isles provided a small reception for the newlyweds after the ceremony. One of our favorite events is coming up in May for it’s 9th year, and we can’t wait! So mark your calendars for this annual tradition that benefits Hospice of the Golden Isles. Pam and Jeff Bickel put on an amazing two day music festival called Americana & Blues. Friday, May 3rd all the fun is centered in downtown Brunswick right next to Tipsy McSway’s from 5 until 8pm. 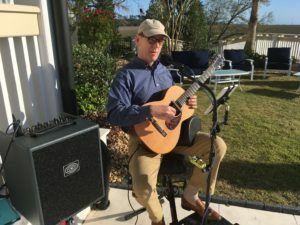 Then on Saturday , May 4th the music continues at The Club @ Bennies Red Barn on St. Simons from 9-12. The featured band is the Noah Witherspoon Band . Want a taste of their bluesy sound? Here ya go! There is a $10 suggested donation to enjoy this fantastic music! Can’t wait to see you there! We did it! 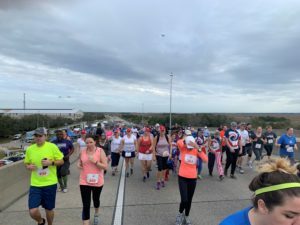 The 2019 Southeast Georgia Health System’s Bridge Run is in the books, and our team is still talking about how much fun it was! 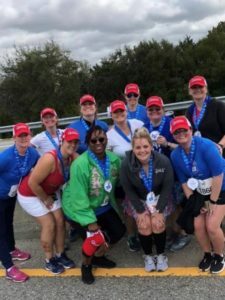 For some of our nurses and administrative staff, this was the first year they walked or ran a 5k over the Sidney Lanier Bridge. 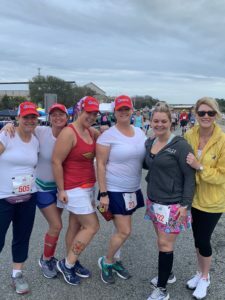 But for Hospice of the Golden Isles, we’ve been participating in the Bridge Run for almost a decade. 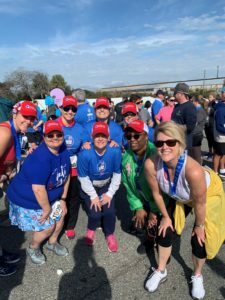 And this year was our biggest year yet with a team of 17 staff members being led by Lynn Franklin, our fearless captain. 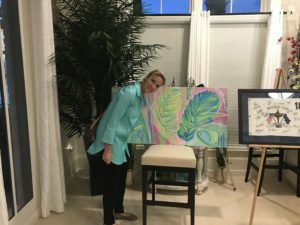 We are honored to help support this fundraiser for the cancer care and cardiac programs at Southeast Georgia Health System. 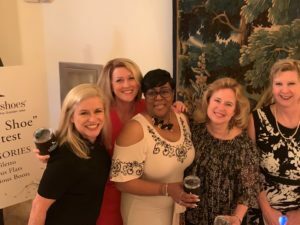 Wine, Women & Shoes 2019 at The Cloister was everything it was expected to be…FANTASTIC! 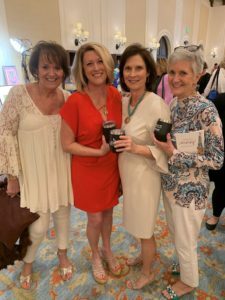 At this sold out event, the ladies enjoyed a fabulous fashion show, wine, and lots of entertainment from the enthusiastic Shoe Guys. 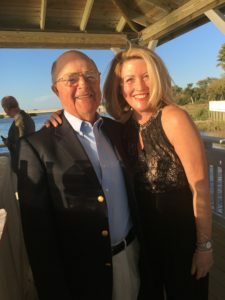 Special thanks to WWS Chairman Becky Derrick! Mason Waters also deserves a shout out for his hosting skills and dazzling wardrobe change. 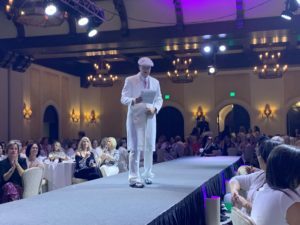 Yes, that’s him on the cat walk (shown below) sporting all white. The Shoe Guy raising the most money was Frank Solana earning him King of Sole status. Jay Wiggins came in a close second, and was crowned Prince of Sole. 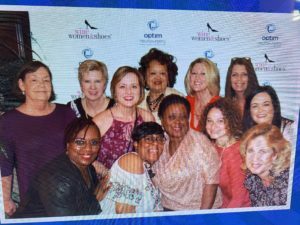 For more on our Auxiliary and WWS click here. Start revving up up those classic sounding Harleys right now! 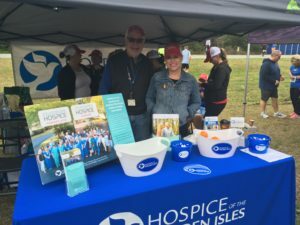 The first annual Harleys for Hospice Motorcycle-Dice Run is taking place on Saturday, April 27th 2019. It’s $20 per bike, $5 for an additional rider, and $5 for extra dice rolls. There will be 50/50 raffle and door prizes. Thank you Knights Paladin Motorcycle Club for sponsoring this fantastic new fundraiser for Hospice of the Golden Isles. For more information contact Sam Preiss at 912-602-5469. All make & model bikes and cars are welcome! 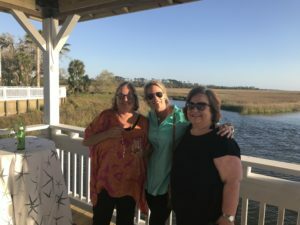 St. Simons Food & Spirits Festival Returns in 2019! 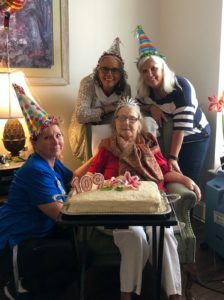 We hate to say goodbye to Charlotte, but at the age of 94 and after almost 40 years of serving Hospice of the Golden Isles (HGI) it’s time for her to be closer to extended family in Pennsylvania. Today, we surprised her during our Volunteer Appreciation Party with a cake, card, and lots of best wishes for her next adventure. 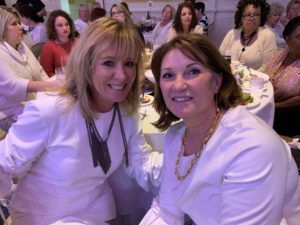 It’s hard to put into words how much we love and appreciate ALL that she’s done for our patients and our staff since 1980. Below is an older blog that gives you some insight into the impact she’s made at our hospice. 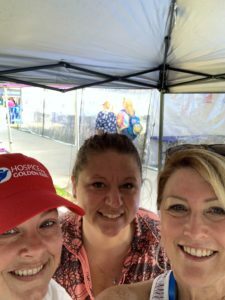 If you’d like to serve HGI as one of our treasured volunteers contact our Volunteer Coordinator Trish Burns at patriciaburns@hospice.me. 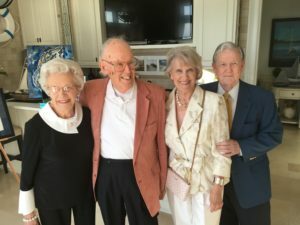 (2018 BLOG) At 93, Charlotte Raymond is showing no signs of slowing down. 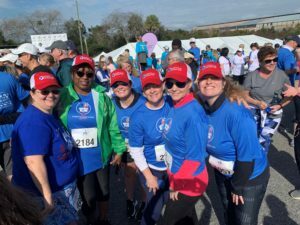 She says her love for Hospice of the Golden Isles (HGI) is one of the reasons she’s still going strong. 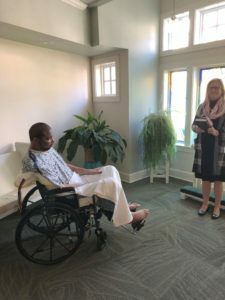 “I love Hospice so much. It stimulates my brain. 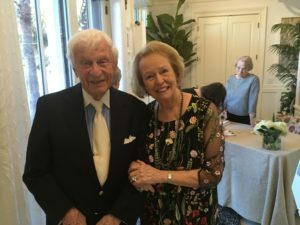 At 93, not much else stimulates my brain,” she says with a laugh. “When I sit and make prayer shawls, it makes me happy to know the joy I’m giving someone else when they get one of them,” says Charlotte. 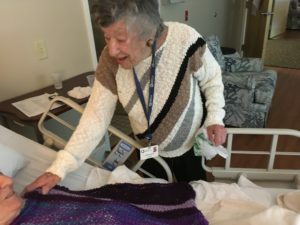 Charlotte has been making prayer shawls for patients since her earliest days with hospice almost 38 years ago, which is also when also when HGI was founded. 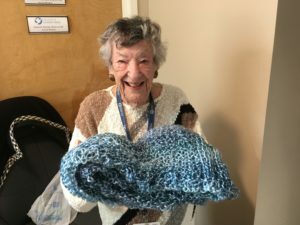 “I got the idea for knitting a prayer shawl from a book I got as part of my training with hospice” explains Charlotte. 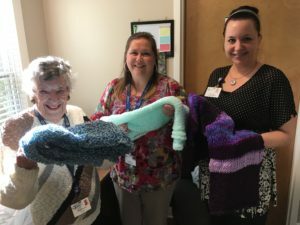 Charlotte estimates that she makes around 200 prayer shawls for Hospice each year. “I sit in front of the TV and knit. I put love and prayer in all of them. I probably spend about 15 hours a week making them. It’s therapeutic for me,” she says. Charlotte is not only a beloved part of HGI’s history, she also keeps track of our non-profit’s history. 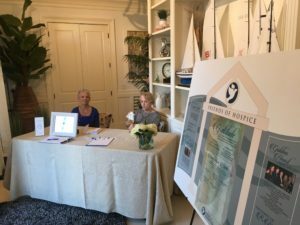 Each Tuesday, Charlotte comes to Hospice and places all published materials about Hospice of the Golden Isles into our scrapbooks. She is quite meticulous about making certain that everything is recorded. “This is my passion. This is our history,” says Charlotte. Each week, after Charlotte has finished her work preserving our history, she can be heard walking down the hallway telling everyone, “I’ll see you all next week, good Lord willing!” To which, we reply “Then, we’ll definitely see you next week Ms. Charlotte.” If you’d like to donate yarn for Ms. Charlotte’s prayer shawls contact Patty Crosby, VP of Development at pattycrosby@hospice.me or 912-265-4735. 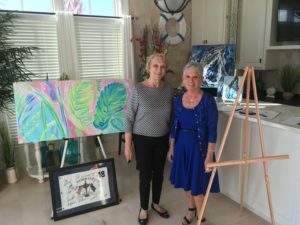 And, if you’d like to become one of our treasured volunteers like Ms. Charlotte contact Trish Burns our Volunteer Coordinator at PatriciaBurns@hospice.me. 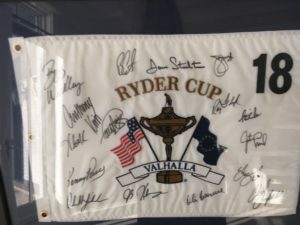 109! What a great way to celebrate New Year’s Eve! It’s a VERY happy New Year’s Eve at Marsh’s Edge retirement community today. In addition to the normal year end festivities, there was a milestone birthday being celebrated. 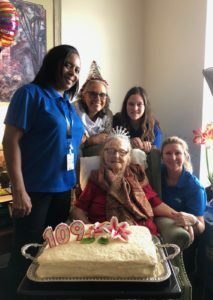 Mrs. Cecil Woods, who is one of our hospice patients, just turned 109! She’s been living there for three years. Up until then, she was living independently. Yes….on her own! 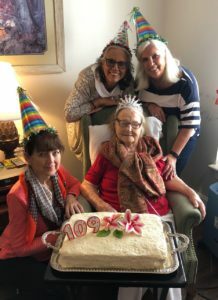 When asked what she’s enjoyed the most about living past 100, she said the people. She loves everyone, especially the staff at Marsh’s Edge. “Nice people, I love them. And, I think they love me” said Mrs. Woods. 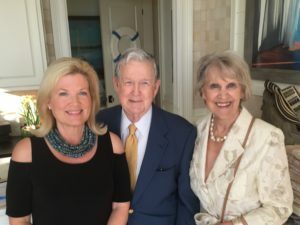 To which the staff eagerly replied in unison, “Yes, we do!” They prepared her favorite dessert for her birthday, a Pea-Picken cake which I’m told is a southern delicacy with pineapple and mandarin oranges. When I asked if I could try a piece, Mrs. Woods said “Of course, sugar…I’d love for you to have some of my cake.” Have to say, it was very good. I really enjoyed getting to know Mrs. Woods on her special day. I learned that she was born in Eatonton, GA and moved to Huntsville, Alabama when she was three. 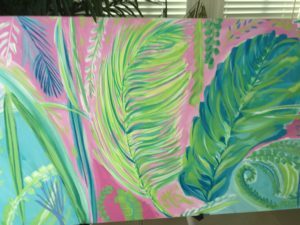 She became a seamstress and fashion designer in Miami while dabbling in real estate, buying and selling homes there. Before I left, Mrs. Woods said she had a good birthday and was ready for 2019! We should all have that passion for people, and zest for life. Happy New Year everyone! 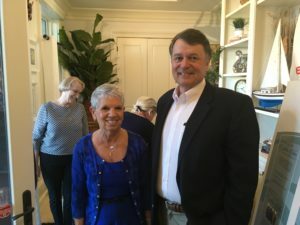 To make this an even sweeter birthday for Mrs. Woods, Lewis Turner from First Coast News gave her a special greeting on New Year’s Day. Click Below to see the video.